Cranial nerve and brainstem dysfunction: On physical examination, patients with Chiari I malformation can have signs indicating cranial nerve and brainstem dysfunction, namely nystagmus, extraocular movement palsies, facial sensory loss, dysphagia, dysarthria, and tongue atrophy. Ataxia, as well as spinal cord and cerebellar dysfunction also are present occasionally. Similar to Chiari I: Neonates are usually asymptomatic. Infants can present with life-threatening episodes of apnea, stridor, and bradycardia or with failure to thrive due to dysphagia. Older children and adults present with symptoms similar to those of Chiari I malformation, namely ataxia, nystagmus, dysarthria, progressive scoliosis, or signs of myelopathy. 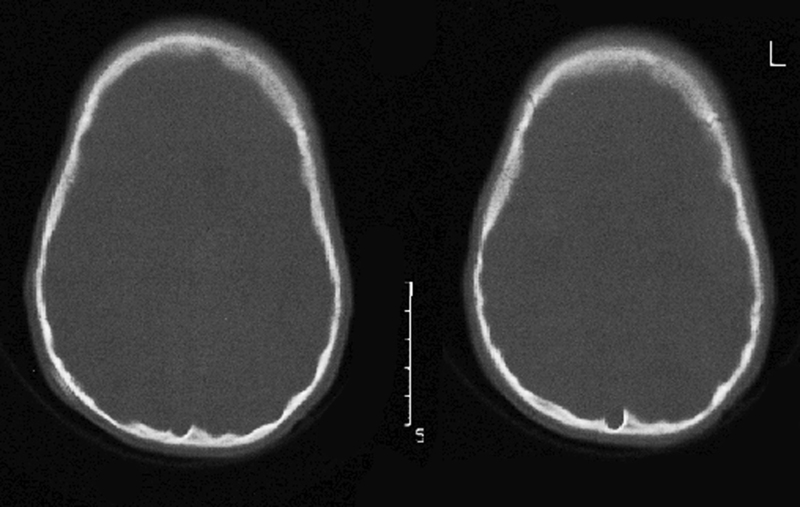 Nonspecific signs of elevated ICP: Plain skull x-rays can show signs of chronic elevation in the ICP, particularly in patients with Chiari II malformations. Plain x-ray, lateral view: The image shows lückenschädel or scalloping (crescent-shaped areas) of relative lucency posteriorly. Not examination of choice: Caudal displacement of cerebellar tonsils can be evaluated with CT but is better visualized with MRI. Chiari II – secondary bony changes: In Chiari II malformations, some abnormalities are better seen on CT scans, including lückenschädel (85% of cases), scalloping of the posterior surface of the petrous pyramid (80%), falx hypoplasia (53%), falx fenestration, tentorial hypoplasia (95%) with a wide incisura and tiny posterior fossa, enlargement of the foramen magnum (73%), and inversion (or transtentorial upward herniation) of the cerebellum (10). Axial CT scan windowed to show bone: The image shows scalloping of the skull’s inner cortical surface posteriorly (i.e., lückenschädel). Rule out other etiologies: One must first rule out a supratentorial mass lesion, hydrocephalus, and history of multiple lumbar punctures, as these conditions may cause tonsillar herniation (acquired Chiari) (8). Chiari I: By far the most useful test for diagnosis is MRI, in which descent of the tonsils to the foramen magnum is measured. In a study by Mikulis et al., normal tonsillar position correlated with age (19). As measured from a line drawn from the basion to opisthion, the tonsils may be considered in normal position when they herniate up to 6 mm in children 0–10 years of age, up to 5 mm in older children and young adults (10–29 years of age), up to 4 mm in adults 30–79 years of age, and up to 3 mm in individuals older than 80 years. Other important findings include a syrinx (50–70% of patients) that is usually (but not always) cervical (18) as seen on T2-weighted MRI. 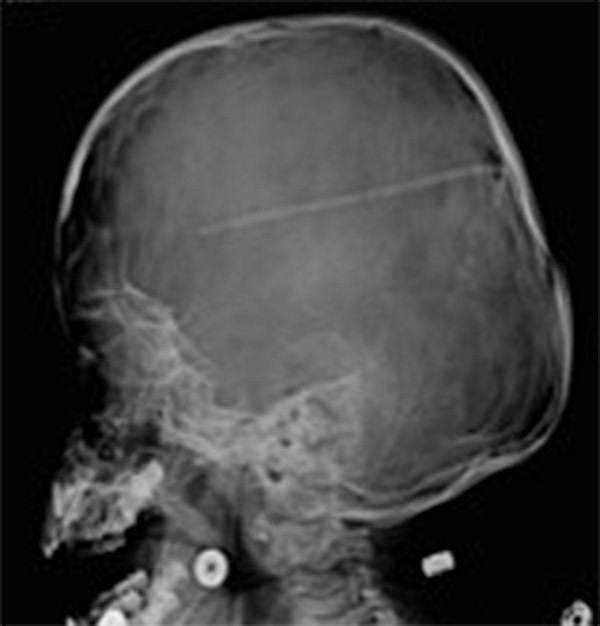 The appearance of pointed or tapered tonsils generally confers greater pathology, as does evidence of skull base abnormalities such as platybasia, basilar invagination, and ventral compression. 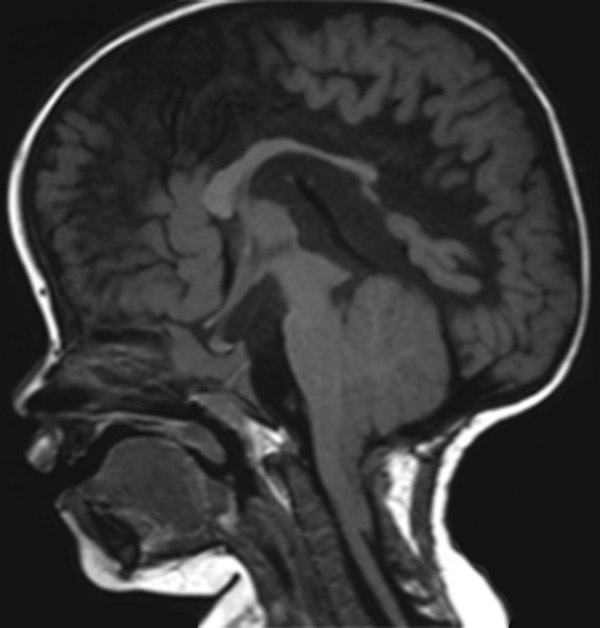 T1-weighted sagittal MRI of Chiari I malformation: Note the pointed tonsils herniating through the foramen magnum with caudal pole under lamina of C1. Also present is a small syrinx that increases the diameter of the cord focally at the C7 level. 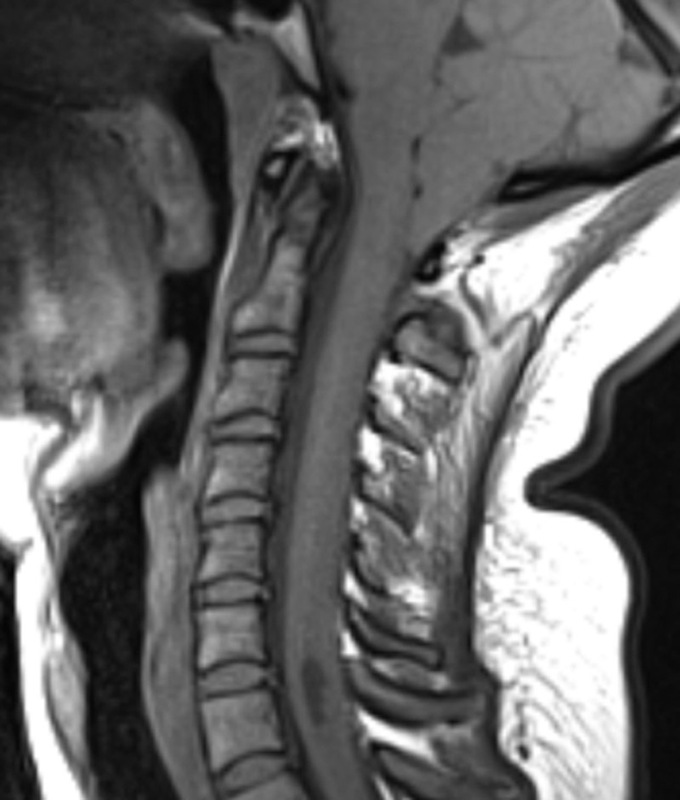 Chiari II: MRI imaging shows herniation into the upper cervical spine of the vermis, medulla, and fourth ventricle, along with multiple other associated anomalies such as tectal beaking, a cervicomedullary kink, low-lying torcular herophili, small cerebellum with tentorial hypoplasia, craniolacunae (lückenshädel), a lemon sign (scalloping of the frontal bones often seen on prenatal ultrasound giving the appearance of a lemon), large massa intermedia, a banana sign (absence of the cisterna magna and abnormal shape of the cerebellar hemispheres resembling a banana on ultrasound), and syringomyelia (in 40–95% of cases) (25, 26, 27, 35, 36). T1-weighted sagittal MRI of Chiari II malformation: Note the various anomalies including large massa intermedia, tectal beaking, descent of posterior fossa structures into the foramen magnum, and a vertically oriented tentorium with low-lying torcular herophili. Cine MRI of unclear utility: The cine MRI has been used to study the CSF flow patterns at the foramen magnum, but so far there have been conflicting results with regard to sensitivity and specificity (1, 5). Cine MRI of CSF flow in Chiari I malformation: Note the white CSF anterior to the cord indicating flow, and the lack of CSF flow posterior to the tonsil. Unclear utility: Electrophysiological studies generally are not useful in diagnosis but may be useful at surgery. A few studies suggest that brainstem evoked potentials may help to predict those infants with Chiari II malformation who will become symptomatic (40). Somatosensory-evoked potentials are unreliable in the diagnosis of syringomyelia. Examination and imaging: If a patient has significant symptoms referable to a Chiari I malformation and a confirmatory MRI without evidence of craniocervical instability, posterior fossa decompression is advised. The presence of syringomyelia in association with Chiari I malformation is an indication for surgical decompression of the posterior fossa. Craniocervical instability: The presence of brainstem compression from craniocervical instability triggers a discussion about concomitant craniocervical fusion. Subtle craniocervical instability is often evident on morphometric measurements to determine the extent of basilar invagination, platybasia, and ventral compression. Measurements include the clivovertebral angle, pB-C2, the Grabb-Oakes line, and others (55). Imaging of ventricles in Chiari II: Symptoms of Chiari II malformation with or without ventricular dilatation on imaging should trigger a shunt evaluation.